Optimize the potential of your website as a sales tool by creating a custom Web To Lead form to encourage people to inquire online and turn valuable information into an instant lead. Web to Lead allows you to use pre-existing pages on your company's website, to capture contact and profile information from users and automatically generate new leads in Operate, enabling you to respond in real-time to customer requests. Use the Web to Lead feature to generate HTML code and pass it to your webmaster to drop into your existing website page. To get started go to Settings > General > Customize > Leads > Web to Lead. Click New if this is your first web to lead record. Click on the Generate HTML button to create the code, it will appear in the HTML Body area below. Save your Web to Lead, then click on Back to the list to return to your list. Before you send the HTML to your webmaster, try it out to make sure you are happy with it. Click Actions > Edit, then click the Try It button, underneath the HTML Body. Fill in the fields and click Submit to send the test lead to Operate. The form HTML code that Operate generates does not contain a Captcha feature. However, you can select a Captcha tool you want to use, then embled it within the form's HTML body. This ensures that visitors submit the Captcha before submitting the form. Operate will generate raw HTML for your Web to Lead form to drop into your website. Pass this html to your webmaster. Click here to see an example of HTML. Date Fields - Dates must be passed to Operate as dd/mm/yyyy. You can choose to put a validator on the web page or make sure you convert the date before sending. 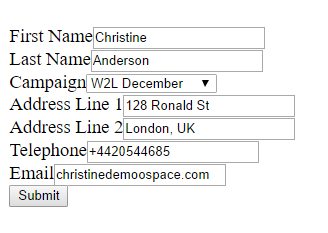 Pre Completing Fields - if you want a web to lead field to be pre completed you can use the HTML code value="xxxx" with xxxx representing the value you would like to populate the field with. Hiding a field - if you would like to hide a field in the web to lead formyour web developer may be able to do this via updating the CSS or alternatively you can hide the section of the form by using a hidden attribute. Simply past <p hidden> at the start of the form and then </p> at the end. Making fields mandatory - You can make submissions to certain fields mandatory by adding a required tag to the input.